But first... what is a "primary" break, and what is a "secondary" break? 1. Getting the defensive rebound. 2. A good, quick outlet pass. 4. Maintaining control. "Be quick, but never hurry." 5. Recognition.. not forcing the break or pass if it is not there. A secondary break is used to rapidly move the ball up the court after a made basket or inbounds situation. We want to push the ball up the floor quickly before the defense can get set. You can even use this as a press breaker if you get it in quickly, before the press has time to get set. A key is to immediately get the ball out of the net and quickly inbound it to your point guard. The initial setup and lanes are similar to the "80" press break. This numbered break and the "80" and "60" press breakers complement each other well and are easy to teach together. After the opponent scores... O3 gets the ball out of the net quickly and passes in-bounds immediately to O1 while O2, O4 and O5 sprint up the floor. O2 runs wide up the right sideline to the right corner. 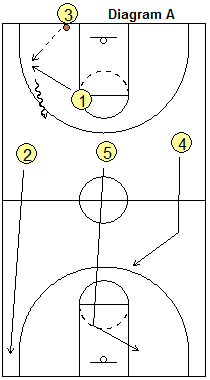 O5 "rim runs" looking for the long pass and then moves to the left block. O4 sprints to the top of the arc in line with the left lane line (see diagram A). O1 speed dribbles up the floor and O3 is the trailer behind O1 (diagram B). Our numbered break has five (numbered) options. 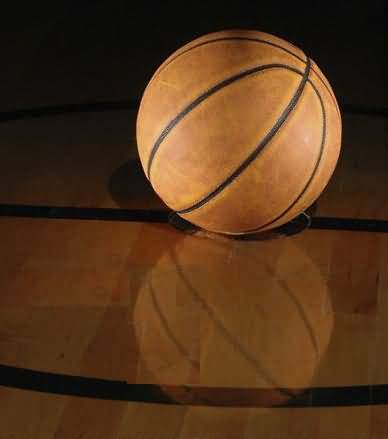 In practice, we run all five options up and down the court using the "5-on-0, 5-trips drill". Option 1. O1 makes the dribble-move in the seam for the lay-up (diagram C). O1 dribbles up to the right three-point arc area, looking to make a move and takes the ball all the way to the hoop. 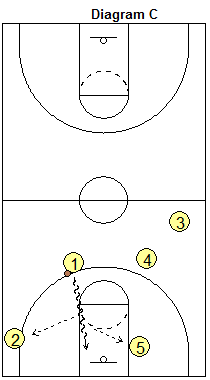 On the dribble-drive, O1 looks to score, or dish off to either O2 or O5. The "in-and-out" dribble move works well here. Option 2. O1 passes forward to O2 for the shot from the corner (diagram B). Option 3. 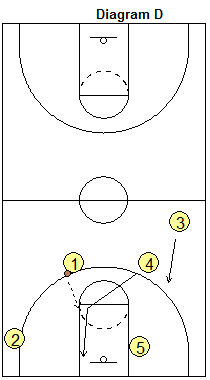 O1 makes the long pass to the rim-runner O5 for a lay-up (diagram B). This pass has to go over the defense, so there should be some arc on this pass. Option 4. O1 passses to O4 cutting through the lane. We call this the "4-cut" and it requires some explanation. O4 must first read what O1 is doing. If O1 is able to take the ball to the hoop, then O4 delays and then trails O1 looking for the offensive rebound (Diagram C). If O4 cuts too soon, it clogs the seam and we don't give O1 a chance to make the dribble-move to the hoop, which is always our first option. But if O1 stops outside, O4 makes a hard flash cut to the ball-side block for the pass from O1 (Diagram D). Errors here are O4 cutting too soon, and O1 making the pass to O4 from too far away... this pass to the cutter should start just outside the 3-point arc. Option 5. O1 passes to the trailer O3 for the outside shot. O3 fills the left top spot vacated by O4 cutting through. 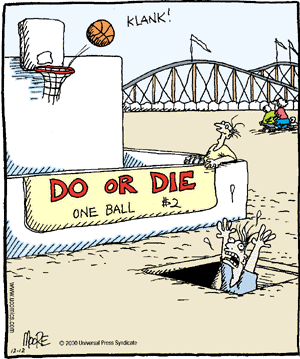 If nothing develops, just flow into your half-court offense. This is part of the "recognition" aspect... don't force things if nothing is there and the defense has done a good job in getting back. 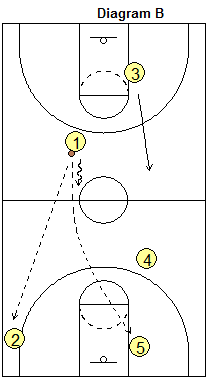 We also run this break after a rebound, in which case the post player who does not get the rebound is the rim-runner, and O3 initially runs wide up the left sideline to the left wing-corner area, but will fill up top if O4 makes the "4-cut". By running the secondary break, you will likely get a few easy baskets in transition and you will speed up the game, causing the opponent to fatigue. Also, because of the threat of your running, the opponent may keep two guards back whenever they shoot, thereby deceasing their chances for an offensive rebound. with Tom Izzo, Michigan State University Head Coach; 2000 NCAA Champs, 3X National "Coach of the Year".